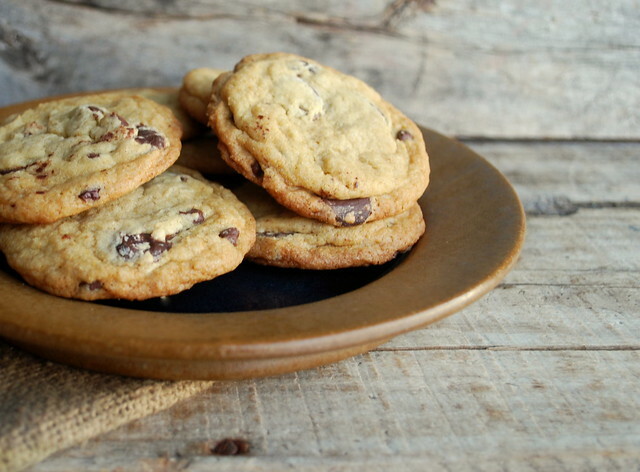 I'm sure everyone has their idea of the perfect chocolate chip cookie and I'm also know for sure that there are many, many different kinds of chocolate chip cookies. Not only can you have a chewy cookie, a thin cookie, a crispy cookie, you can have cakey cookies, crunchy cookies, the list goes on and on. You can make cookies with granulated sugar, brown sugar, coconut oil, Crisco, cookies made with whole wheat flour, all butter, chilled dough, you can see where I'm going here, it's endless. This is the recipe that my family loves the most. This is the cookie that my kids call addicting, and I have to admit, they kind of are. You can't eat just one because once you put that perfectly chewy, chocolate loaded, caramely cookie in your mouth, once your done with it, you instinctively will reach for another and another. They are that good. The two things that make this cookie different from a lot of other cookies is cornstarch and maple syrup. I'm convinced that what makes these cookies amazing. I really think you need to use pure maple syrup in these. You can use pancake syrup in a pinch, but I think real maple syrup makes all the difference. You do have to chill the dough before you pop these bad boys in the oven, so a little planning is needed. I don't remember where I got this recipe. It was on a tattered scrap of paper in my recipe file and I can't tell you how many times I've made these. I can't believe I never blogged them before. 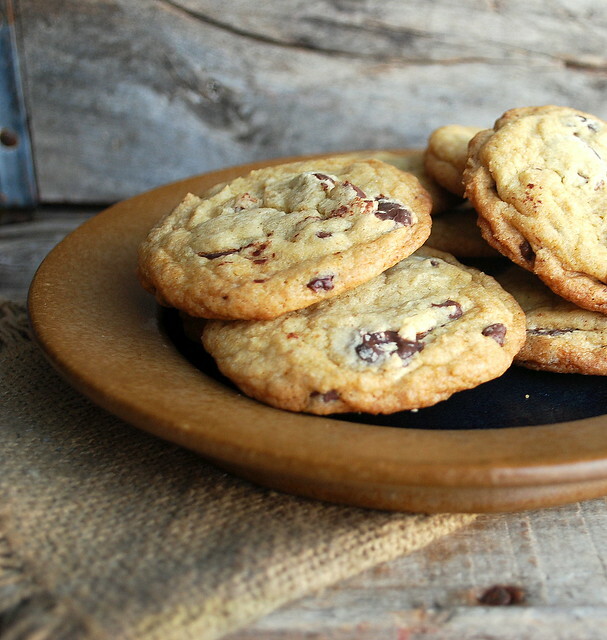 Hopefully they will become your favorite chocolate chip cookie too! In large bowl, stir together melted butter and sugars. Add eggs, one at a time, stirring until combined. Stir in vanilla extract and maple syrup. In separate bowl, whisk together flour, cornstarch, baking powder, baking soda, and salt. Gradually add flour mixture to wet ingredients, stirring until completely combined. Stir in chocolate chips. Cover bowl and allow it to chill for at least an hour. Preheat the oven to 350. Once the dough is chilled, I used a cookie scoop to make the cookies. I packed the scoop and then placed the dough on a parchment lined cookie tray about 2 inches apart. Bake for 13 minutes. Don't worry if they look a little under cooked. They will set up perfectly. Allow cookies to cool for about 15 minutes on the sheet pan before moving them to a cooling rack to cool completely. After I put the first batch in I scooped out the rest of the dough onto a platter and then put it back in the fridge. You don't have to scoop all the batter at once, you can scoop it out as you go but make sure to keep the dough in fridge in between batches and do not place cookie dough on a hot cookie sheet. I used 3 cookies sheets so I always had one cooling, one with cookies on it and one ready to go in the oven. *Note - I use Ghiradelli 60% cacao chips in when I make these. 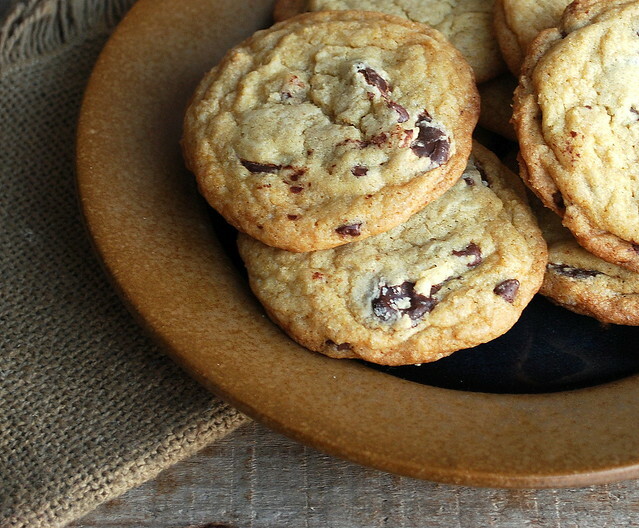 We like the fact that they are a bit less sweet and a tiny bit bigger than regular chocolate chips.